The world is warming, the ice is melting, Polar Bears are cute and cuddly and will be extinct any moment. The Polar Bear is to the Thermageddon enthusiast what the Giant Panda is to the WWF, a poster child. Please send money. The reality is far more complicated. The Arctic has indeed been warming. In some years summer ice coverage has been well below average. Polar Bears eat seals, mainly Ringed Seals. Ice plays an extremely important role in the life style of both seal and bear. Ringed Seals are widespread throughout the Arctic. They have the ability to keep open a breathing hole through ice giving them access to feeding grounds that would otherwise be unavailable. Pregnant females build a lair covering a breathing hole. Hidden from the gaze of Polar Bears and sheltered from the worst of the weather they give birth to a single pup in March or April which they nurse for 5 to 7 weeks. Sea ice and fast ice is where Polar Bears can hunt efficiently. In some parts of their range ice persists throughout the year either because it never gets warm enough for it to melt or because currents bring a stream of ice from elsewhere. Especially in the warmer parts of their range ice disappears in summer. In these regions Polar Bears have a lot in common with tourist operators. During the season they must make enough to cover their overheads for the entire year. For the Polar Bear this means eating lots of fat young seal pups and then depending on their fat reserves through the summer. A mother Polar Bear stands at a Ringed Seal breathing hole. Two young bears are parked nearby. We observed this situation for about 11 hours. At the end of that time the bear gave up and the trio wandered off. Click on the photo to enlarge it. During the summer they will eat a wide variety of other food stuff but unless it contains a high proportion of fat their fat reserves and physical condition drops. Going hungry is part of the normal cycle of their lives. Mother and cub chewing a whale mandible. It follows that as ice diminishes the carrying capacity of the environment also diminishes. QED. But, what is the current carrying capacity and are seals and bears presently at it? For a century or so prior to the early years of last century the Arctic was plundered for fur and blubber. Populations of seals were decimated. The Walrus on Svalbard was brought to the point of extirpation. Around Svalbard 900 bears a year were harvested in the 1920s and after World War II, there were as many as 400–500 harvested annually. Bear hunting on Svalbard ceased in 1973. The Polar Bear is a K-selected species with late sexual maturity, small litter size, high maternal investment and high adult survival. The Polar Bear’s reproductive rate is among the lowest in all mammals so the population may take a long time to recover. Comparing censuses of 2004 and 2015 gives an increase in population of 42%. Is this due to reproduction or immigration? Dutch ornithologist Maarten Loonen, who has been studying migratory geese and Arctic Terns in Svalbard for more than two decades, has seen the increase, “In 1988, there weren’t even any (polar bear) guidelines and I would camp alone and without a gun.” Not any more. So how many Polar Bears are there? The IUCN which lists the bear as Vulnerable gives a figure of approximately 26,000 and the population trend as unknown. The sole criterion for listing is the projected loss of sea ice. 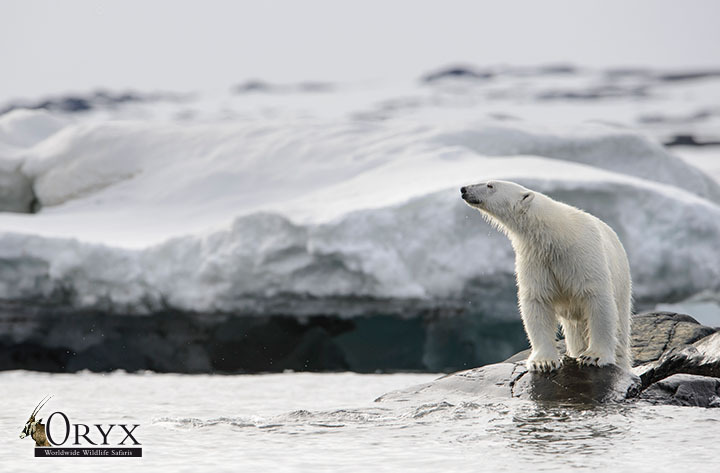 As it stands at present the Polar Bear is one of the most secure large predators on earth. Polar Bear research is not an easy occupation. It occurs in a harsh, remote and dangerous environment. Polar Bears occur at low density over a vast area and are highly mobile. One satellite-tracked female trekked 4,796 kilometers (2,980 miles) from Alaska’s Prudhoe Bay to Greenland to Canada’s Ellesmere Island and back to Greenland. When youngsters part company with their mother at around two years of age they often travel 1000 km to establish their own home range. A study of the swimming behaviour of 52 tracked females found that a third of them made a swim exceeding 30 miles (48 km), as a group they averaged 96 miles (154 km) and longest swim recorded was 220 miles (352 km). Researchers do not follow bears around with a pen and clipboard in the way that Chimpanzees are studied. The accuracy of purported population estimates and changes is uncertain. The Polar Bear Specialist Group and the IUCN link the future of the Polar Bear to the future of Summer sea ice. Since the listing as Vulnerable in 2006 sea ice has declined faster than expected but populations have not. Fortunately, when sea ice returns to normal, numbers have largely rebounded. Future climate is hard to predict but any creature alive today has survived a variety of past climates. Polar Bears have been around for a while. How long? DNA studies, which have thrown bird taxonomy into a state of chaos, offer us a couple of answers. When mitochondrial DNA (inherited only through the matrilineal line) is examined it suggests the Polar Bear diverged from the Brown Bear, Ursus arctos, roughly 150,000 years ago. Further, some clades of Brown Bear are more closely related to Polar Bears than to other Brown Bears. So fairly recently. A study of nuclear DNA found that Brown and Polar Bears diverged approximately 603,000 years ago. So not so recent. Either way it has been through a number of ice ages and the intervening warm periods some of which have been warmer than present. I suspect that there is little risk of their imminent extinction. a warning that, as the sign says, applies to all of Svalbard including behind you. Last year a mother and two cubs spent the night in Longyearbyen. Polar Bears are extremely dangerous and especially hungry for two or three months after the ice goes out. That’s the tourist season. Until new-born seals become available you are the best source of nourishment on the menu. There have been quite a few attacks recorded and five have been fatal in the last 40 years. When you are traveling in the back country there may be a bear just over the next rise. Never leave town without your rifle or a well equipped guide. Camping has proven to be particularly hazardous, trip wires, taking turns on watch and having firearms at hand may keep you out of trouble. But Polar Bears are what I’ve come for. Will I get a photo that conveys their majesty? Will I get a photo at all? Flew Emirates from Oslo to Dubai and then to Melbourne. Their entertainment system is the best. Since I would be arriving in Melbourne at bedtime I decided to tough it out without sleep and hopefully get into the time zone with a flying start. I would recommend some good movies if I could remember what they were. Overnight in Melbourne then picked up the dog. It came as a great relief that after 8 weeks she still loves me. The pick up was carefully timed so that the kids of the house she was staying at were at school – they love her too and will miss her. Thirty millimetres of rain in the gauge and a green veneer in the paddocks. The Victorian Goldfields are looking great. Soon had a fire going in the stove. Went to bed at quarter time in the Friday night footy. Carlton were up at that stage. I’m writing this at 1am, so much for the strategy of staying awake on the plane. Carlton were still up at half time, just. Done by thirty in the end. Poor Carlton, it’s not going to be their year … again. I will get around to writing about Bhutan but I think it makes more sense to finish up the Arctic sojourn first. So Polar Bears and Walruses coming soon to a blog near you. If you are reading this as email please remember that your web server supports features that email does not. Gorgeous, aren’t they … provided you don’t meet a hungry one. Tough, too, having survived many changes in past climate. And currently thriving as you can read <HERE>.